After a bit of procrastination, I decided to dine at Thyme Bistro. The reviews I read on Urbanspoon were very flattering, which prompted me to see for myself. Although the restaurant is very nice and the management and waitstaff are very hospitable, the meal that I had didn't quite measure up to the hype. Becaus e I had a bit of an appetite, I decided to get an appetizer in addition to the main course. 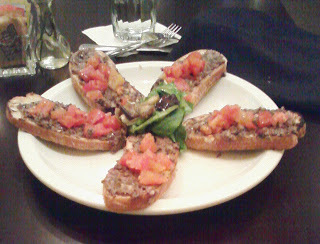 The appetizer that I chose was the bruschetta topped with diced tomatoes and olive tapenade (a French paste). As someone who has eaten a lot of bruschetta in my time (both in Italy and in the States), this was the first time that I served bruschetta in this fashion, and it was literally an eye-opener. After taking the first bite, I immediately got a jolt of spiciness, and I incorrectly assumed that it was horseradish. However Lisa, the lady who served me, said the spiciness was due to the garlic in the tapenade. Well, far be it from me to a critic (of course, this blog wouldn't exist if I wasn't critical), but that was WAAAAAAAAAAAAAAAY TOO MUCH garlic for my taste. Although I tried to drink water to cool my mouth, I should have taken my server's advice and eaten the bruschetta with the pinot noir that I ordered with my main course. Eventually, when I did get my wine, which was a glass of Mirassou Pinot Noir, I ate the last two slices bruschetta and it tasted better. Seems that the bruschetta and pinot noir complement each other. By the way, my server (and probably many others) mispronounce "bruschetta" by annunciating the "chet" syllable in a manner similar to the word "shoe." This is the proper Italian pronunciation for bruschetta, although the Merriam-Webster Dictionary would disagree (this is their version). No matter how you say it, the bruschetta wasn't my cup of tea. 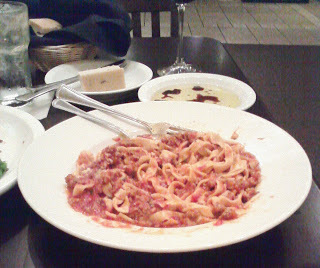 For the main course, I stayed with the Italian theme and chose the Pasta Bolognese. The reason I chose this entrée was so I could compare it to a similar dish that I had at The Villa in Midtown Memphis' Overton Square. The Bolognese pasta that I had at The Villa literally left a bad taste in my mouth, so I was curious to see if Thyme's version could be better, merely the same or worse. Thyme's version of the Bolognese meat sauce is marinara mixed in with pork and beef, which is a nice combination, but the marinara was so ordinary that the sauce didn't "WOW" me. However, it was much better than The Villa's version and it didn't leave a bad aftertaste (although the bruschetta might have). My pasta came with sticks of garlic bread and olive oil for dipping. The texture of the bread was mushy, as if it was half-baked. Biting into it was sort of like trying to eat a sponge, and it wasn't enjoyable. After a couple of bites, I decided to skip the garlic bread. In all, the dinner that I had at Thyme Bistro was so-so, but of course this is just one opinion. Given that the restaurant has received many good reviews means that it is doing something right. However, based on my experience, I can't give it a "thumbs up," but I am willing to give it a second try. By the way, I want to give kudos to my server Lisa, who worked really hard to make sure my dining experience was enjoyable, and I hope that my next visit will be better.